What is a fact but a widely held belief at any point in time, supported by some form of evidence? We rely so much on these so-called facts these days to cement our beliefs that it increasingly precedes our common sense and instincts. We forget that the outcome of research and experiments can sometimes be misinterpreted, misunderstood or even deliberately manipulated to deceive others. Here is a countdown of incidents which serve as a reminder that what we know as facts today may not necessarily be so. Spinach was once thought to be the elixir of strength and popularised by the cartoon character, Popeye. It was considered to be extraordinarily high in iron all because of an error of one decimal place. In 1870 Dr. Emil von Wolff published an article that spinach has ten times more iron than any other leafy green vegetable. 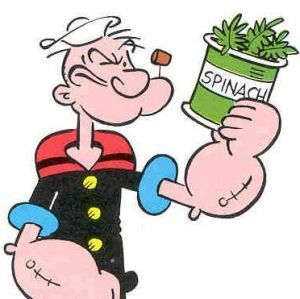 The character Popeye appeared years later in a comic strip, followed by a spinoff cartoon, chowing down spinach to instantly build muscles to save his Olive Oyl from his nemesis Bluto/Brutus. In 1937, a group of German scientists discovered that spinach had only 1/10th of the iron previously claimed. Spinach took a further battering in the 90s when a research found that while spinach had high levels of iron and calcium, the rate of absorption was almost nil. We went through school learning that Guglielmo Marconi was the father of long distance radio transmission. He was supposed to have invented the radio telegraph system and sent and received his first radio transmission in Italy in the year 1895. However, little was known then that a Serb named Nikola Tesla and an Indian, Sir Jagadish Chandra Bose had demonstrated wireless communication through the radio a year earlier in another part of the world. There are also others who are believed to have experimented with wireless telegraphy (Lodge, Fessenden, Dolbear and Loomis) and were embroiled in a patent dispute with Marconi. So why is it that we know Marconi was not the only inventor and yet the history books have not been changed to reflect this? I have no idea. Maybe it has to do with politics, for to acknowledge Marconi was not the only inventor would cause history to be rewritten and a medal of greatness snatched from the British. Who would risk losing favour with the powerful nation over a quibble like ‘who invented the radio telegraph system’? We know the answer to this so well that it would be like a bonus question if it ever came up on quizzes. Nile river…or is it? Again, reference books tell us that the Nile is the longest river, however there has long been disagreement over whether the longest title goes to Nile or the Amazon river. Apparently, the length of a river can be very difficult to measure. There are many factors, such as identification of the source and mouth, and the measurement in between. In recent years, some Brazilian and Peruvian studies have suggested that the Amazon river could be longer if the adjacent Para estuary were included in the measurement of the river. Oh, in case you didn’t know, there is also a dispute over Mount Everest’s height. Nepal has measured it at 8,848m, however, China disputes this as it claims the mountain should be measured by its rock height and not by its snow height. Who knows, we might soon learn the Everest is not the tallest mountain after all! Hopefully that would not be the case as geologists claim that the mountain could now be even higher due to shifting continental plates. So, this planet was demoted to the status of ‘dwarf planet’ in 2006 due to a series of discoveries beginning from the 1970s when minor planet 2060 Chiron was discovered. In the late 20th century and early 21st century, many objects the size of Pluto were discovered, thus posing the question whether Pluto’s status a major planet was justified. The discovery of Eris in 2005, which is 27% higher in mass compared to Pluto in the outer Solar System probably sealed Pluto’s fate. In 2006, the International Astronomical Union (IAU) defined what it meant to be a ‘planet’ in the Solar System, and sadly Pluto did not fit the description. So there you have it: five reasons why we should not have unquestioning faith over what we know as ‘fact’ today. Who can say what we know as an irrefutable fact today may not be proven otherwise one day? Now is the time to question health guidelines like having your ‘5 a day’ (fruits and vegetables), drinking 1-3 litres of water a day, ‘facts’ on global warming…the list goes on! So, the next time some know-it-all tries to win an argument by relying on ‘facts’ without considering opposing ideas, please point them to my blog to quash their over-confidence!